05.14.08 Day 3 is a dramatic day at the Elementary Nationals. It is the day that new national stars emerge, trophies are won, and new motivations are born for those who didn't perform as they had hoped. This year's tournament featured a clearly tougher field than recent years. 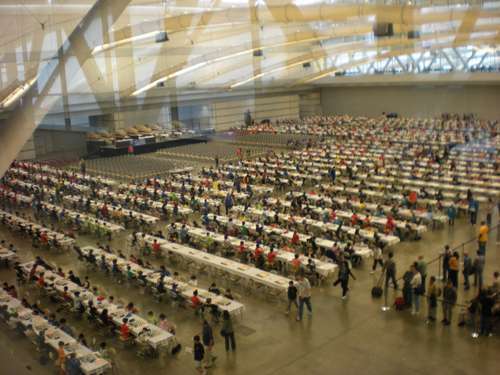 The main playing hall in the David Lawrence Convention Center before Round 1: chess boards as far as the eye can see. 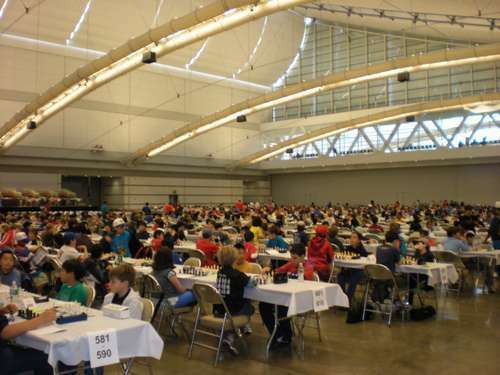 ChessMaine reporter-on-the-scene Dan Fishbein reports live from Pittsburgh and the Elementary Nationals Chess Championship. You can keep updated with round by round results and pairings here. You can also watch selected games at MonRoi.com. Parent after parent commented that their kids found the competition to be much stronger than they had expected, and that competition from states other than New York, California and Texas was remarkable. 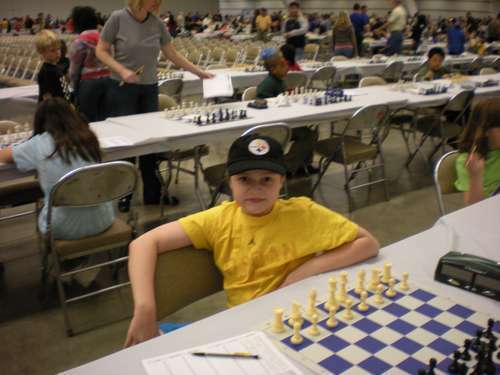 It seemed that if you were paired against someone from Minnesota or Michigan or Washington State you were in trouble, because with fewer USCF tournaments under their belts these were competitors whose abilities were much higher than their current USCF ratings. For the Maine contingent nonetheless the weekend ended with a solid overall set of performances, even though no trophies were won this year. Matthew Reale-Hatem started the day with a draw against Asia Hudson of Michigan, and finished strong with a victory over Kasimir Schulz of North Carolina. Matthew Fishbein ended up on the losing end of matches against Apurva Virkud of Michigan and Alexander Peichel of Minnesota. Zach Hamilton lost his first round of the day to Victoria Choy of New York, and then finished with a win over Bryant Vorhees of Utah. Olivia Reale-Hatem finished her first tournament on the down side of matches against Charles Thomas of Ohio and Jed John-Burnley of New York. 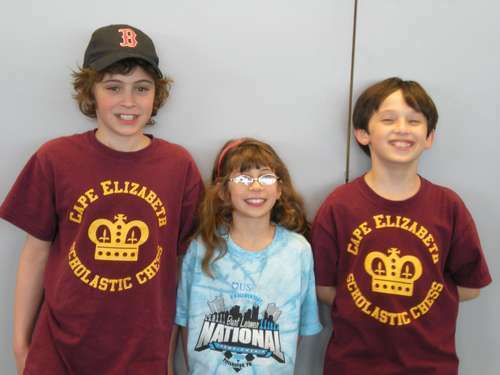 Including Blitz and Bughouse, the little Maine team earned 29 points against this tough national field. Another interesting aspect of the day was a vote taken by loudness of applause just before the start of the last round. At the Scholastic Council meeting the day before, this author proposed changing the tournament schedule in the future so that teams could depart on Sunday afternoon, a goal a number of schools had raised by asking that they be allowed to take byes in the last round. This might facilitate even larger attendance. My suggestion was to instead hold the first round on Friday morning, vs. the current 1:00 p.m. Friday start, so that 7 rounds could be complete by midday Sunday. 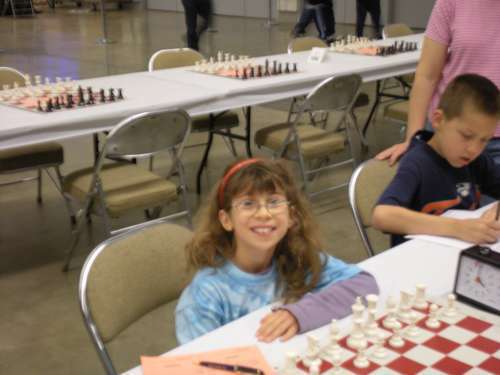 I also joined a few others in proposing that the time controls be reduced from G120 to G90, which was supported by the USCF Board members on the Scholastic Council, especially since it is consistent with the time controls used in World Youth events, and since it seemed more conducive to kids' sleep schedules. 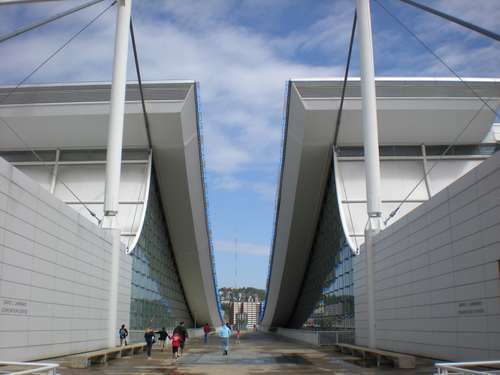 The Council decided however that instead of the votes of the 20 people who decided to attend the meeting, that they should ask the parents and kids en masse, which turned out to be a great idea. The loudness vote overwhelmingly defeated both changes, especially the change in time controls. And it turned out it was the KIDS who were the most opposed to any changes. And so this appropriately helped end this year's tournament--the kids made the decisions. This weekend was all about the kids in every way. A great opportunity for kids to shine, while the adults stayed largely in the background. 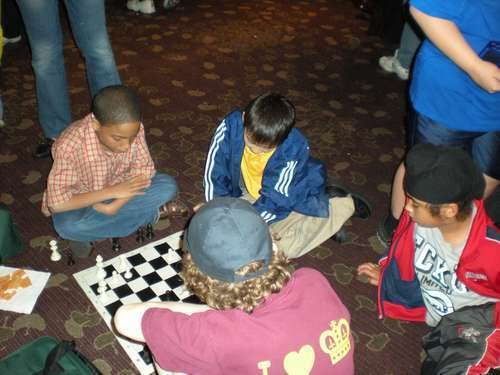 The Atlanta Braves, who were in town playing the Pirates, were staying in the Westin, the tournament's HQ hotel, along with many of the chess players. Numerous elevator and other encounters with Braves players, coaches and announcers revealed a true fascination and respect from the major league baseball people with these major league chess players. They clearly admired the competitve spirit, discipline and hard work...regardless of the sport. A final note: next year are the Supernationals in Nashville, April 3-5. 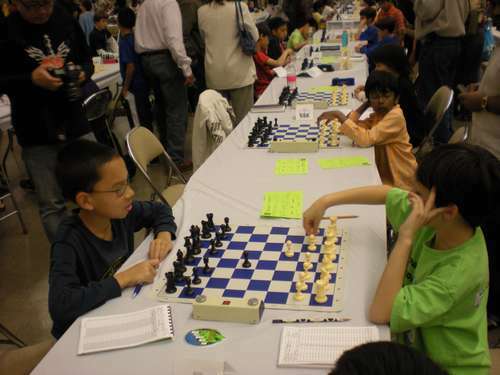 Held every four years, this tournament combines the Elementary, Junior High and High School tournaments into one mega-tournament that is likely to draw over 6,000 players and parents. This is a great opportunity for Maine to send a much larger team to play on the national stage. Many other states had their top 3 teams in each category present in force. Maine was under-represented by any calculation. So, start fundraising and planning now! For scholastic players, this is an event not to be missed. 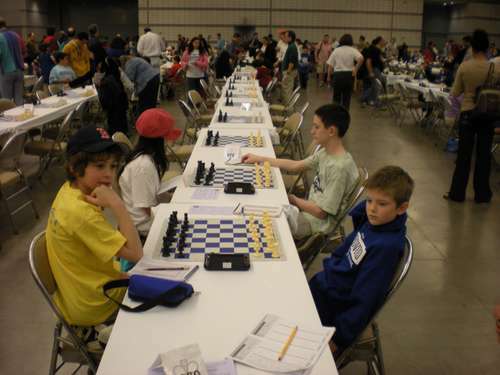 Matthew Reale-Hatem (right) prepares for a Blitz round. 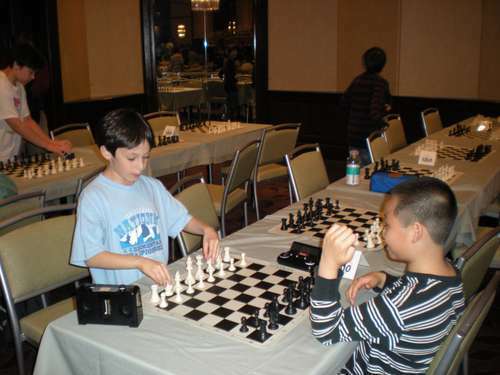 Matthew Fishbein, a la Veselin Topalov, prepares his pieces and himself for a Blitz game before the main tournament. In between Blitz rounds Matthew Reale-Hatem plays some skittles with new friends. 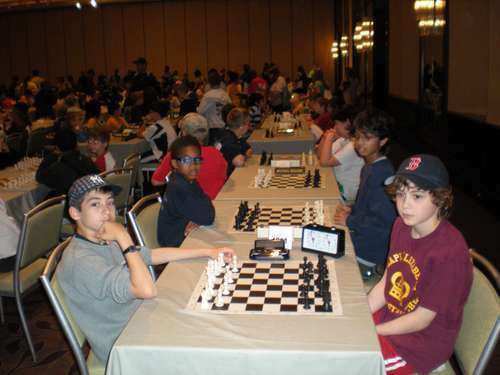 Matthew Fishbein (right) and Michael Brown (who finished 4th) discuss openings prior to the start of their Round 2 game in the K-5 Championship section. Matthew Reale-Hatem (left) prepares for his 3rd Round game against Nathanial Osborn of Washington State who won the K-6 U1000 section. Zach Hamilton scored 4/7 in the K-6 unrated section. Olivia Reale-Hatem gets ready for her 3rd Round game against Alex Pena of California. 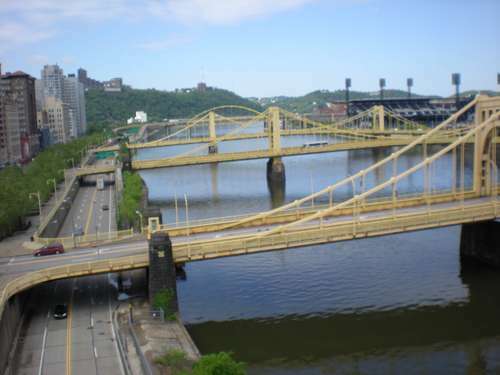 The City of Steel: Some of the 113 steel bridges that cross Pittsburgh's three rivers (here it's the Allegheny), with PNC Park, home of the Pirates, in the background. 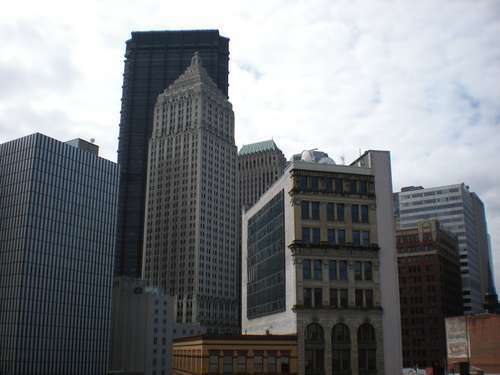 The Pittsburgh Skyline as seen from the Convention Center.